Ewen McGee has been a visitor to Coll for decades, and his mother’s generation were regarded as cousins when they arrived for prolonged stays in the 1900s. His earliest known ancestors lived during the 1700s at Feall, a township that is now hidden under blown sand. Further generations regarded Caolas as home, with the males more likely to be at a boat’s tiller than ashore tilling the soil. Ewen recognises that the sea is in his blood, but maybe rather thinly. 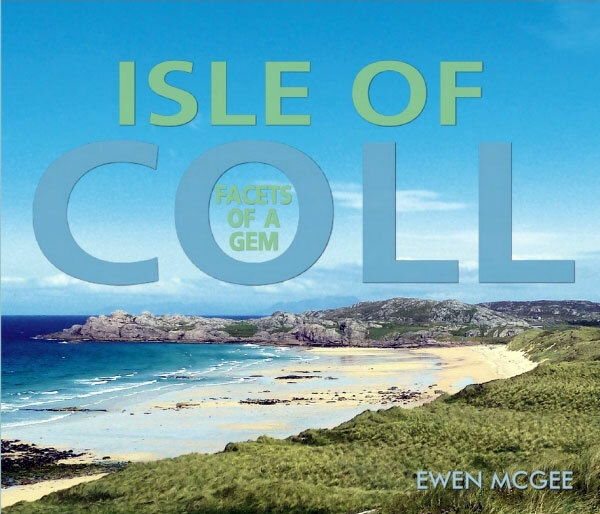 One day on Coll in 2007 he chanced to hear of a publishing firm’s query – was anyone writing anything new about the island? – and that set the ball rolling. Ewen will tell how he spent the next eight years gathering as many scraps of Coll information as he could lay his hands on, amounting eventually to many hundreds of pages of material. Earlier evenings round a peat fire in one Coll house or another provided tales that had roomfuls of folk in tears of laughter. He may recount some stories that crept out of the woodwork but didn’t somehow creep into the pages of the book. For some fresh photos, the rough bounds of the island which lie well off the beaten track were explored on foot. Questions will be most welcome and answers may even be forthcoming!